This capelet is an easy modification to the Openwork Bolero and has been added to the bolero pattern. 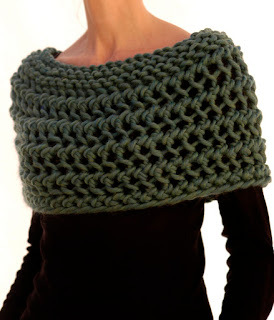 A quick and easy pattern for at least an intermediate knitter this capelet uses 1 skein of Cascade's Magnum, #19 needles for the openwork portion and #17 for the garter stitch neckline. A great gift to make for the Holidays... speaking of which, Happy Thanksgiving! Hope you all enjoy! les explications sont elles également en Français ?